I should probably start by saying that I am by no means some great yogi! This post is for the regular folks out there that enjoy some yoga, but cannot … no matter how many times they go… remember what the heck any of the poses are called, with the exception of downward dog and child’s pose! I would say the absolute best time to go to yoga with a baby is when you are pregnant! I looooooved prenatal yoga! Even if you have never done yoga before I would still recommend giving it a go! I know it can be intimidating but I’m telling you, with the right instructor, it can be absolutely awesome! It was great for making new friends and before class we would always have a little check in … a great time to get some commiseration and ask any questions that weren’t really Dr. related… like “where around town to get tall pregnancy pants” or “anyone else slept like 2 hours last night?” It was also so relaxing and nice to just take some time for myself. I cannot recommend giving it a go enough!! Once I had H I needed time some time to heal up… unplanned C-sections with some complications (another story, for another time)… but once I was feeling more myself I started doing mom and baby yoga (I want to say when H was almost 3 months). I did this at a different studio because some of my mom friends were already going there… and it was great! I do think that the instructor can make a big difference, but in all my friends and my own experiences, the people that are teaching prenatal and mom + baby yoga are usually wonderful humans to begin with! It is important to have a teacher that understands what you body has been through, and can guide you through appropriate moves. I really loved that this studio was so warm… It wasn’t hot yoga or anything, but I must admit that I did nearly fall asleep a few times at the end of class. Most of the mom + baby classes I have seen have said in some way or another no crawlers… which makes sense if you want to get any yoga done! That being said, depending on your experience with the instructor, other moms, and if you are really loving it, there are ways that it can also work with a little mover! I really appreciated that we were all moms, so if you need to feed your baby… no problem! Baby crying… mine too! Arrive super late… hey you made it! It was a very supportive environment that reminded me I am not alone! I found taking this time with H to do something for myself, so early on, was really important! I had to somewhat drag myself out of the house to get there, but once I was there I would always think, “This is just what I needed!” Whether it is yoga, a hike or maybe eating that large cupcake it is so important to take care of ourselves! If you are in Calgary I did my prenatal yoga at The Yoga Studio (Cannot recommend it enough!) and I just happened to do my mom + baby yoga at The Bodhi Tree (another wonderful experience!). Both places offer prenatal and mom + baby yoga and I wouldn’t hesitate to recommend either! What a sweet thing to do with your baby! It was so great… Even for the simple excuse to get out of the house!! I didn’t get back to yoga until my little one was two – I wish I’d been able to do it, but with three kids at home it just wasn’t possible. Good for you for getting back to it. With three kids that is completely understandable! I am trying my best to take advantage of my time with one! Oh please do pass it along! Yoga can seem so intimidating but I found both prenatal and mom + baby yoga so encouraging! I am a yoga fiend! Not that I am an expert yogi either … but it feels so wonderful! I can only imagine how lovely prenatal yoga is! I always wonder how everyone remembers the poses! Haha and prenatal yoga is as lovely as you imagine! Yoga was one of the very first activities I did with my daughter when she was only a few months old. I loved it! 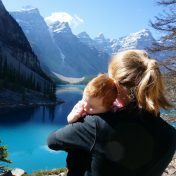 It gave me a chance to ease back into being active (I also had an unplanned c-section), and it was great being around other parents with young kids. I am so glad you had the same wonderful experience with yoga that I did! Taking that time for myself was so important! I’m a huge fan of prenatal yoga! Now I’m doing postnatal! Do you live in Calgary, girl? My sister is there and her BF is the guy that runs Stampede (K. Merrington.) We come every year. Do you go? I do live in Calgary… I usually only go to stampede if I have out of town guests… Otherwise we have a tendency to leave town! It gets a bit crazy for me, but it is a good time for sure! I’ve never thought about doing yoga with my baby. Might need to try this. I know it seems a bit odd… But it’s awesome!